Welcome to the mineral photo gallery. Minerals are natural inorganic chemical compounds. These are photographs of minerals, along with a look at their chemical composition. Trinitite consists mainly of quartz with feldspar. Most trinitite is light to olive green, although it is found in other colors, too. The corresponding Russian material is called Kharitonchiki (singular: kharitonchik), which formed at ground zero from the Soviet atmospheric nuclear tests at the Semipalatinsk Test Site in Kazakhstan. Azurite is a deep blue copper mineral. Exposure to light, heat and air all can fade its color. Azurite is a soft blue copper mineral. Emerald is the green gemstone form of the mineral beryl. Beryl is a beryllium aluminum cyclosilicate. Diamond is a crystal form of carbon. Diamond is a carbon mineral which is highly valued as a gemstone. Emerald is the green gemstone form of the mineral beryl. Many gemstone-quality emeralds come from Colombia. Emerald is the green gemstone variety of beryl, a beryllium aluminum cyclosilicate. The molecular formula for fluorite and fluorspar as CaF2. There are six species of garnet, which are categorized according to their chemical composition. The general formula for garnet is X3Y2(SiO4)3. Although garnets are commonly seen as red or purplish-red stones, they can occur in any color. Jasper is an opaque, impure mineral composed of silica. It can be found in nearly any color or combination of colors. Kyanite is a sky-blue metamorphic mineral. Morganite is the pink gemstone variety of beryl. Ruby is the red gemstone form of the mineral corundum. Sapphires are corundum in every color except red, which is called ruby. The Star of India is a 563.35 carat (112.67 g) grayish blue star sapphire that was mined in Sri Lanka. Daniel Torres, Jr.
Sapphire is a gemstone form of the mineral corundum. Sapphire is a gemstone form of cordundum. Smoky quartz is a silicate. Topaz is an aluminum silicate mineral. 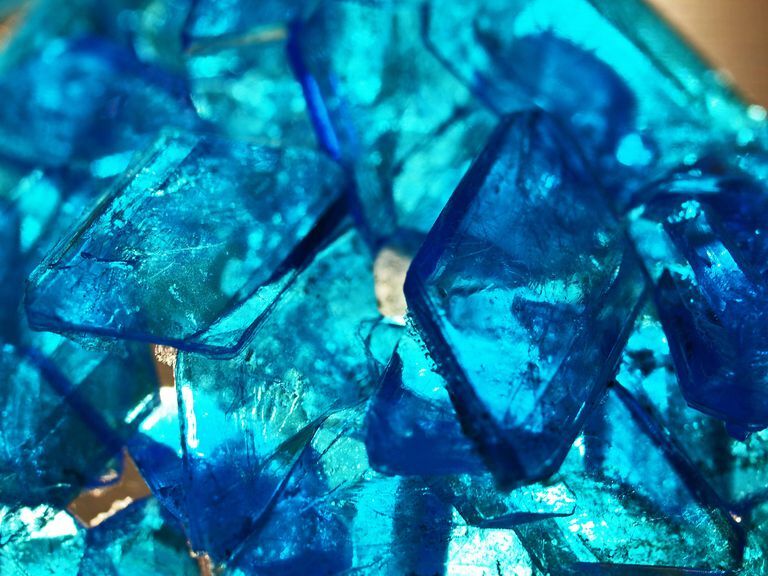 Topaz is an aluminum silicate mineral that occurs in a wide variety of colors, though the pure crystal is colorless. Topaz which contains minute quantities of impurities is colored. Turquoise is an opaque blue-to-green mineral consisting of a hydrous phosphate of copper and aluminum. Trinitite is a mineraloid, since it is glassy rather than crystalline. Moldavite is a silicate glass or a glass based on silicon dioxide, SiO2. The green color most likely results from the presence of iron compounds.